It is not unusual to find technicians familiar with photoshop who claim that you can “fix” an image and make it interesting when it originally was not. Personally I think no matter how nicely you polish crap, all you will end up with is polished crap :). On the other hand it is entirely possible to spend the same time (in photoshop) and effort on something that started out passable and end up with something decent. The bottom line for me (and this is a personal position that I do not suggest is necessarily “right”) if you are going to spend a whole lot of time on your computer on an image it makes sense to start with something of reasonable quality. And while garish “improvements” to an image are possible, it may be better to try subtlety. Note here, I rarely take this advice myself. Quite a few of my presets are anything but subtle :). Before I ramble along at length let me clarify; I use Adobe Lightroom to do most of my processing and Photoshop from time to time as might be occasionally necessary. 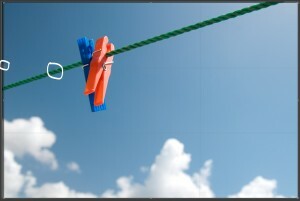 I have nothing against the use of either of these tools to whatever degree the user might consider necessary, I just don’t believe that you can fix a poorly composed, poorly lit image or make an uninteresting image into an interesting one. 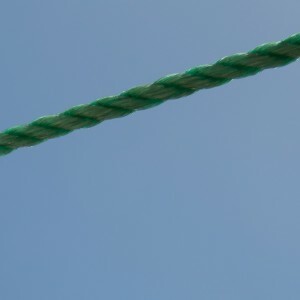 One other thing, by subtlety I mean a viewer should not look at a photo and think “nice job with photoshop”, or “he really knows how to use layer masks” or anything similar. Anyway, onto my real point. Processing with subtlety. 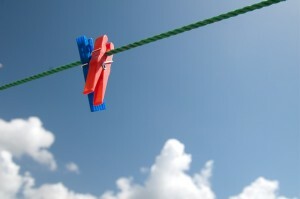 On Saturday I was looking around to take a photo, I saw some clothes clips nicely lit against a blue sky with some nice puffy clouds in the sky. Everyone has taken (or will take) a photo of clothes clips. Art it ain’t, but it can make a nice photo (might be good enough as a stock shot, but a million photographers have probably done it already). As usual, I don’t pick a feature and tell you how to use it, I pick a photo and tell you how I did it. Most photos don’t come in for anywhere near this much processing. In fact, most of what I consider my best photos took minimal time and processing. There is a lesson in there somewhere. As you can see, the crop was minimal, and just to get part of my neighbour’s television antenna out of the extreme left of the frame. I used spot removal for a spot on the rope. Blue skies can be unforgiving of spots on your lens and sensor. 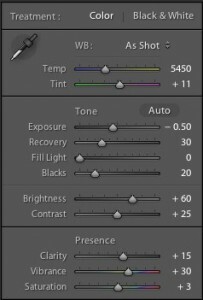 The <R> key invokes the crop tool in Lightroom. 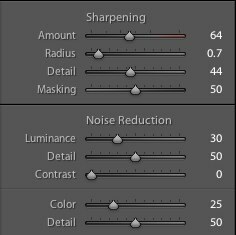 The next major step I decided to take was sharpening and reducing noise. No major philosophical reason, I just wanted to get rid of the noise I was seeing in the blue sky because it was irritating me. 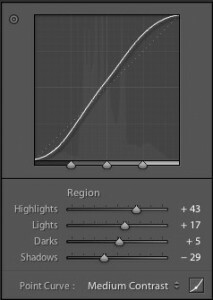 With Lightroom, the sharpening step doesn’t have to come at a particular part of the processing sequence as Lightroom performs the steps in an optimal manner (theoretically) when you export the image. Okay, so the effect on screen is subtle, but it is there. I have a number of presets that I have worked out over a few years of using Lightroom that are suitable for the “types” of photos that I prefer taking. 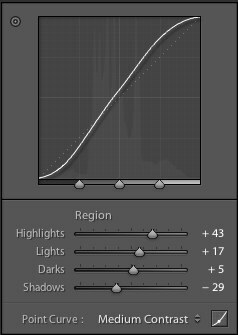 A substantial percentage of the time I use one of those presets. When I take a more unusual photo for me, like this one, I tend to have to go through all the steps in the processing to get to what I want. After the NR and sharpening I raided the Basic panel in Lightroom to get closer to what I had seen. I pushed the exposure a bit to the right, so pulling it back a bit was part of the processing. Most of my photos never go past the Basic panel, I use a preset, then make minor corrections to suit. This one though had a taste of almost everything :). One major bit of correction/alteration that I had to make (thanks to my failure in adopting a proper technique) was the use of graduated filters to even out the tone in the sky. I forgot to take off the polarizing filter so it caused the part of the sky at 90° to the early morning sun to appear considerably darker from the rest. I evened it out as best I could using the graduated filter feature. At this point I had gotten all of the basic stuff as I had wanted, but the image needed a bit more “pop” (for my tastes anyway). So I hit up the Tone Curves and brought some contrast to the shot. At the end of it all I got what I wanted, more than 2 hours of writing a blog post (yes, I know I talk too much) and about 10 minutes worth of actual processing :). Eh, doesn’t really look like I did anything much apart from darkening the sky, does it? Well, I’m trying to be subtle (with the processing anyway, not so much with the apparent saturation :). Thanks for reading if you managed to get this far. Simple and very nicely put. I agree that subtlety makes for much more interesting photos, and I usually hate when people often assume that you’ve done a “lot of work” in photoshop myself. 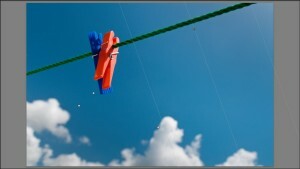 This is a good demonstration of the power of Lightroom to use simple tools, and sliders to bring to the viewers yes what was intended by the photographer in the first place. I think that you did improve the image greatly, when I think I’m done in Lightroom with an image I often go back to it and undo much of the changes until I get a degree of subtly. very nice tutorial, i like the shot as well.